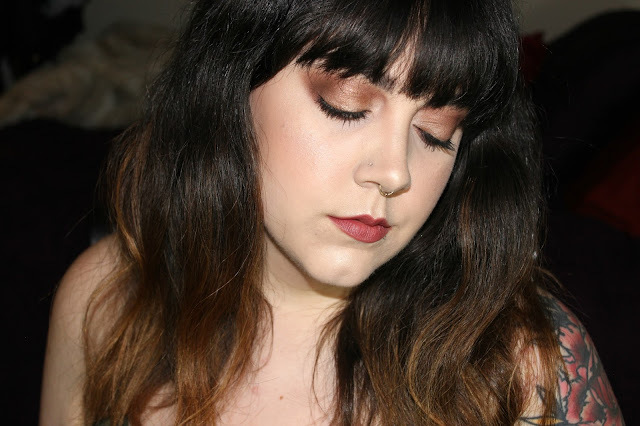 If you don't already read my blog, I reviewed the Rainforest After Dark Palette here, so if you haven't. read that feel free to get all the details on the palette on that post. This post was a request by a reader to do a tutorial from this palette. To be honest I was flattered that someone wanted to see a how-to from me. So here we go! The picture on the left is from my original post and the one on the right is from today's, as you can see they're very similar, but the on from today is slightly more dramatic. I decided to do a variation since it's easy to just do less. This will give you two looks to try and play with. I made a number chart of the palette so it's easy to follow. I first primed my eyes with Urban Decay Primer Potion in Eden. Then I took 1 in the inner corner of my eyes and the brow bone. Next I swept 2 all over the lower lid and lightly into the crease, just under the orbital bone. I went back in with 5 just in the inner corners, blending onto the lid. Next I took 3 and lightly blended that all across the lid. 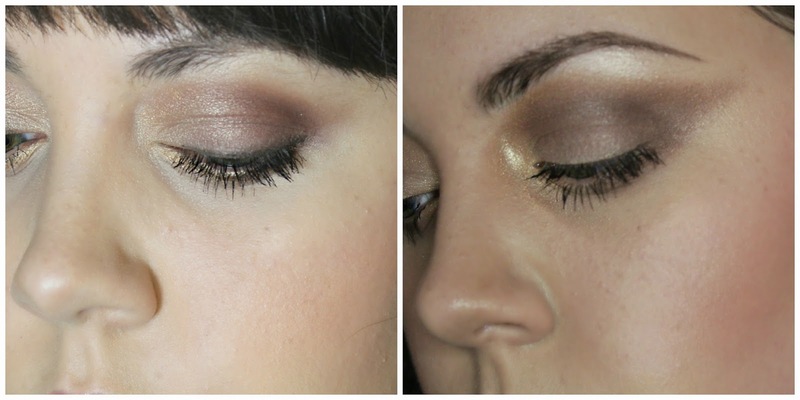 I then blended 6 into the crease and slightly above the crease as my blending color. Take 4 and start working that into the same place that you put 6 in the last step and blend out into a slight wing. Without adding any more product to your brush blend the wing down under the eye. 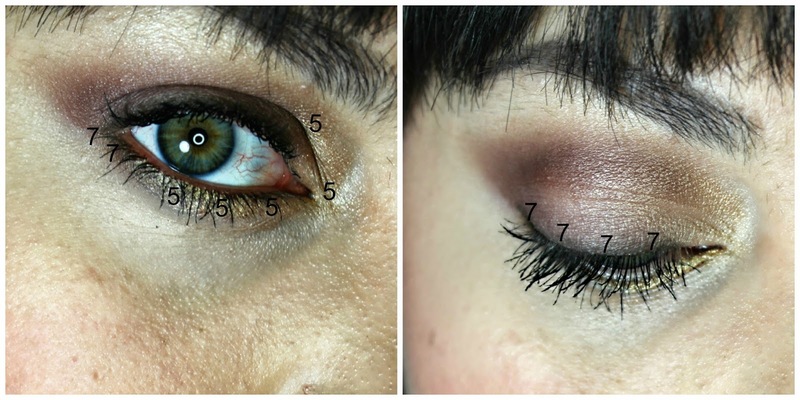 Then take 7 and blend that around the outer corner of the eye socket and blend over 4 under the eye. Then I grabbed a clean blending brush and smoothed out any harsh edges. Then I took 9 on the upper 2/3 of my cheeks and 1 on top of the higher point of my cheekbones. The steps I skipped that I did on my original look are to smudge 5 under the lash line and 7 along the top lash line and under the outer corner. I also lined the my water line and tight line with a chocolate brown kohl pencil. I did all the same steps other than that just less dramatic and a bit softer. This time I topped it off with Poe from the Kat Von D Studded Kiss Lipstick range. You could also pare this with a neutral lip if you want to do something more subtle, as I know many people wouldn't find this look with this lip terribly wearable. and that you found it easy to follow. If you do re-create either look please show me your re-creations and interpretations on Twitter, Instagram or Tumblr. Thank you so very much for reading and don't forget to subscribe to see more from me either here or on Bloglovin'! Which look would you wear? Let me know in the comments, I'd love to know!